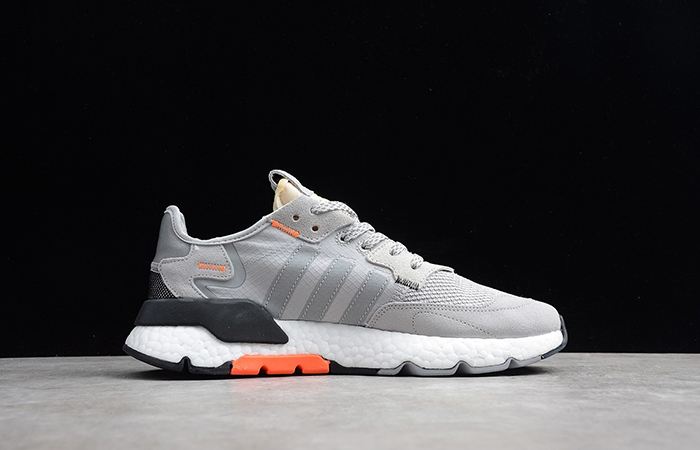 adidas Nite Jogger Orange is all set to drop for the Fall Festival with a gentle and soothing colour palette. adidas is starting to jump back into the traditional racks this time. The features and hints from the late ’70s come back to the pavilion but with much higher engineering and foot-friendly additions. Back in the days, the Nite Joggers were the most decent runners for a long ride from dawn to dusk. With proper strides and high-quality features, this one will become the champion for the sneaker race of 2019! You must have seen the recent one that came out with bold black upper and neon accents. This one, in particular, wears a little dull and monotonous colourway of light and dark grey. But the tangy punch of the orange adds a sassy Fall aesthetic to the somewhat monochrome theme. It has a reliable street ready toolings and season-perfect attitude. You can flaunt it with any of your outfits no matter what. The retro aesthetics and the hallmark detailing are the best choices for a remake like this. Follow @FastSoleUK for more. Make sure you have your purse clenched and get ready to run after it. It won’t be staying for long this season. A simple and straight forward shade of light grey spreads all over the net-mesh upper body. The net and nylon mesh combination works perfectly for all-season stunts and strides. It keeps your feet fresh and snug every day. Tonal grey suede overlays and leather three stripes catch up to the vibes. The quirky appearance of the orange stitches and sole plate pop up brightly from the dim grey silo. A snowy white Boost slab sits underfoot with black plastic heel support and outsole. 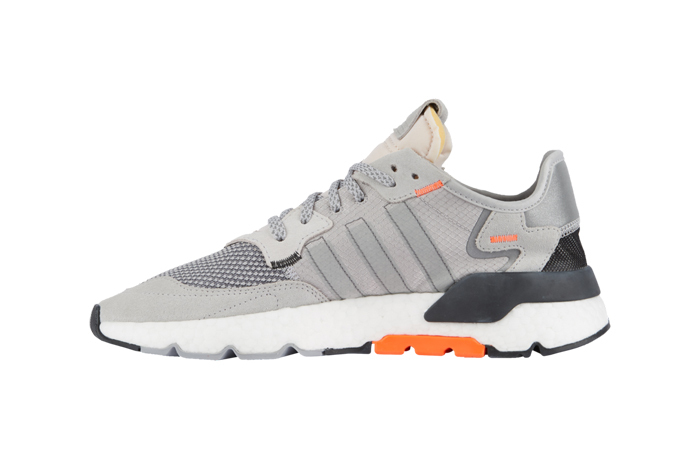 adidas Nite Jogger Orange releases April 10th via listed UK and European retailers. It’s best with casual outfits when you go walk around the neighborhood. Check for yourself whether or not it fits party attires!